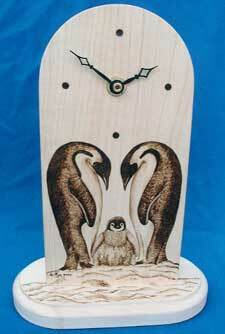 The selection of designs shown in this gallery are examples of previous work on two styles of clock. All are fitted with a quality quartz movement which takes one AA size battery. Full details on having an individual piece especially created for you can be found on the Commission page. 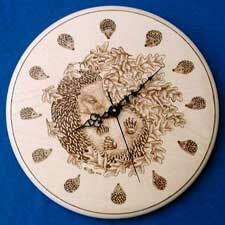 Extremely detailed designs adorn these circular 9" diameter solid sycamore clocks, each of which incorporates the features of the clock itself. To see the stages involved in creating the wren design on the right, please visit the Design: Wren Clock page. 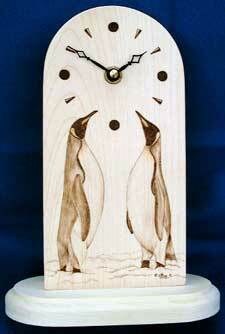 Penguins are ideally suited as subject matters for these solid sycamore mantle clocks, 8.75" tall. 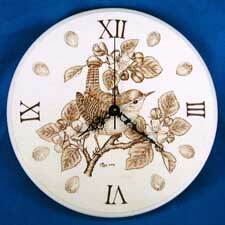 The features of the clock are again incorporated within the design.